In the last post I mentioned that I was thinking about the past and the future, and this post was to be the photo about the “future” I was thinking about. I recently spent a very packed week doing some “sports” photography, something that I don’t do. I was volunteered to assist with the photography of the Junior CASA (Caribbean Area Squash Association) Squash Tournament. 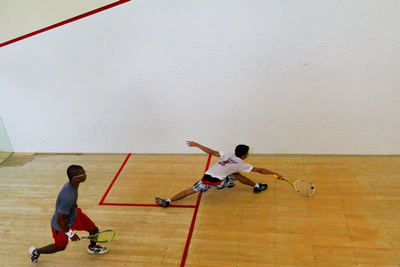 Squash is an indoor game, played on a “closed” court, and in Guyana, there is very little area available for viewing, much less photographing the game. The lighting on the courts is not exactly geared towards photography either, the courts are lit by flourescent lights (some more than others), three of them have glass backs, but the reflection in the glass are an obstacle by themselves! I took photos in each of the five courts, two of them I had to shoot through the glass, no choice, two others have no glass wall, and I had to shoot from the spectator area above the back of the court, and the last court I shot through the glass, from the spectator area at the back of the court, and from windows high on the side of the court. It was a learning experience, hours on hours shooting, hours and hours sorting the photos looking for acceptable ones, playing with camera settings just to get the shutter speed up! The full gallery of photos from the tournament is at their home page, there are contributions from at least three photographers (all amateur) including myself. I guess what made me think of the future for this photo, was that it was a Junior Tournament, so maybe some future great squash players, and for some of them (the players in the Under 19 category, like these two) it is their last year as Juniors, their future in Squash is with the Seniors.